Lombardi Letter gives you proven investment and stock market advice delivered into your mailbox daily from top analysts and economists. We called the start of the bull market in gold in 2002 when bullion was trading under $300 an ounce. In 2005 we told our readers to get out of the real estate market. Our top 19 stocks picks posted an average profit of 187.32% last year (not a misprint). See where we are making money in 2016 and what our combined 100 years of investment experience can do for you starting today! To opt-in to our FREE daily e-letter Lombardi Letter and to get your FREE report, "Gold: The Stock Contrarian Investors' Best Play of the Decade," enter your e-mail address in the box below. You can unsubscribe at any time. With Lombardi Letter, you are receiving news, opinions, commentaries, and interpretations of economic events from seasoned financial analysts and economists. We analyze the actions of the stock market, precious metals, interest rates, real estate, and other investments so we can tell you what we believe today’s financial news will mean for you tomorrow! Combined, we have over 100 years’ experience in analyzing various investment markets. Our analysts include MBAs, BAs, B.Comms, P.Engs, MAs, LLBs…and most importantly, years of experience investing and managing our own money successfully! 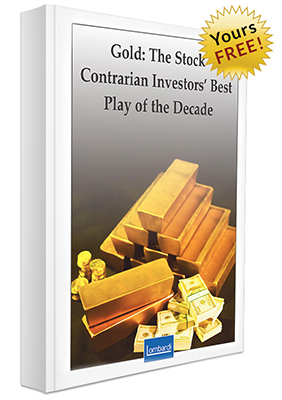 To opt-in to our FREE daily e-letter Lombardi Letter along with our special offers and to get your FREE report, Gold: The Stock Contrarian Investors' Best Play of the Decade, enter your e-mail address in the box below. You can unsubscribe from this FREE service at any time. This is FREE from Lombardi Letter. You can unsubscribe at any time.